Digital painting is the new normal for entertainment art. 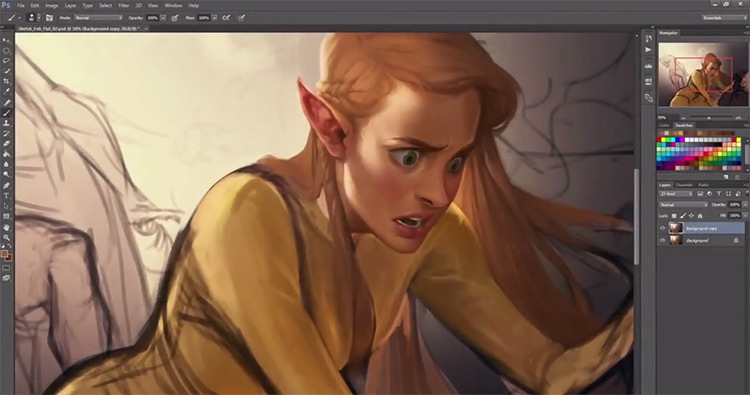 Whether you want to create comics, characters, or insane concept art, you’ll want to learn digital painting. This involves learning two different skillsets: the painting software(like Photoshop) and how to draw/paint on a tablet. We’ve covered some great books on digital painting, but personally I think video courses are much easier. They offer step-by-step instructions where you can watch a professional work in real time. Many even have Q&A sessions or mentorships to help improve your skills faster. I’ve listed my top picks for the best online classes & courses to help anyone learn digital painting. Doesn’t matter what type of art you want to make or your current skill level. This list is gonna have something for everyone. Paintable Academy deserves the first mention since it’s basically an entire community on digital painting. Really, Paintable is amazing. This works on a subscription model where a monthly fee grants you access to the full library of videos + the community. Paintable offers a super targeted library focusing on just digital painting. Over 150+ videos, dozens of exercise files, and monthly live workshops offer plenty to do each month. Everything about Paintable should appeal to digital artists. Whether you wanna work in cartoons, movies, video games, or just paint for fun, this site has everything you need to get started. Take a peek at their preview video to get a quick sample of the lessons and the video quality. Also the main page has much more info on the community, video topics, and the teaching style. If there’s one community dedicated to helping you improve as an artist, that community has to be Pencil Kings. It’s a massive community of artists from all skill levels who share tips, advice, and critiques on their work. But Pencil Kings also has a huge library of videos on many topics like illustration, portraits, and concept art. One such video is Digital Painting for Beginner Artists. No doubt one of the better courses on painting because it takes you from the very beginning and teaches all the core skills needed to paint on a computer. In this course you’ll study from artist Jade Mere as you learn how to use brushes in Photoshop, how to work with layers, and more professional tips for easy coloring. Note that tablets feel very different than traditional painting. Even if you have some background in oils or watercolors you’ll still have a learning curve. Thankfully Pencil Kings only publishes clear & concise videos. 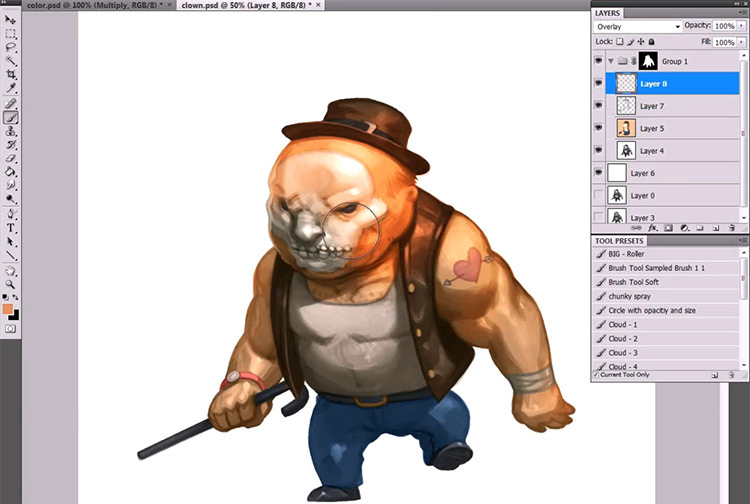 This course is by far their best for beginners jumping into the world of digital painting. And Pencil Kings offers two ways to access: you can buy the course for a flat fee or join the community for a monthly subscription. The monthly sub gives you access to all their videos along with the PK forums. These forums are one of the few places online to get genuine critiques on your work. If that’s something you’re after then it’s worth subscribing. Otherwise you can get the flat course for pretty darn cheap. And if you’re a novice at digital painting you’ll be amazed how much you can learn. Every artist should know about Ctrl+Paint. 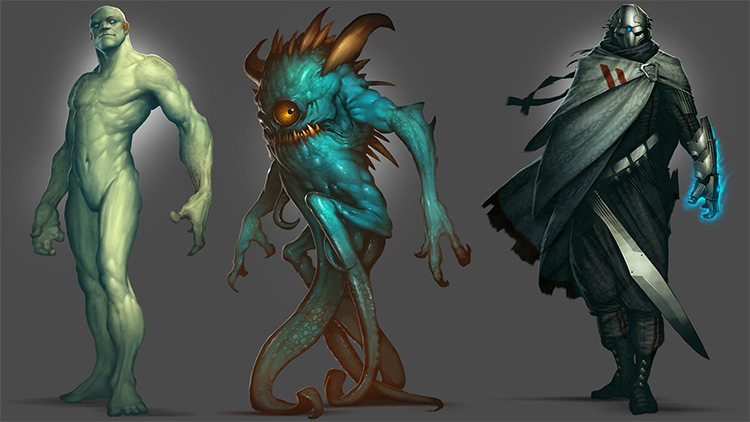 The site was created by Matt Kohr who’s a professional concept artist with years of experience on various projects. He created the Ctrl+Paint website as a genuine resource for digital painting. It literally says so right on the about page. This is perhaps the “original” digital painting resource for artists. Ctrl+Paint has been online for years and the videos are just as relevant today as ever before. I actually recommend skimming the main YouTube channel to have a look at some of Matt’s videos. Many of these are released for free just to help artists get started. But Matt also has digital products like the Digital Painting Starter Kit(among many other courses). Matt uses a freemium model much like Proko where you can view free videos online, but the premium vids have the real goodies. Still I recommend browsing Matt’s free video library to start. It’s huge and the video quality is seriously top notch. From there you can check out some of the premium courses, most priced around $10. You’ll find tons of variety in this library. Whether you try the premium vids or stick with the free options, Ctrl+Paint should be a site you keep bookmarked. It’s basically the Harvard of digital painting and it’s gonna be around for years to come. All the courses in CGMA are unique, feature instructor critiques, and get new updates with each semester. These courses aren’t singular pre-recorded videos like others I’ve mentioned in this post. Instead CGMA runs live training with instructors who release new videos each week. You then complete homework given to you each week, then offer your work to the instructor for critiques. It works much like an online school where you study with an instructor and you’re given homework with each lesson. Their best course on digital painting has to be, as you might guess, a course titled Digital Painting. It runs for 8 weeks and you’re given deadlines each week for new practice work. You might notice on the course page it says videos are pre-recorded for each lesson. This doesn’t mean the videos are recorded once and left alone for years. This means the instructor records new videos for each semester to improve the training with each batch of students. Please note: if you’re brand new to drawing/painting digitally then unfortunately this course won’t help. It mentions pre-reqs on the course page which recommends that students take Fundamentals of Design first. But the pre-reqs for that course are Dynamic Sketching one and two. This means you’d basically have to work through a semester’s worth of courses(and over $1500 in fees) just to go from newbie to competent enough for the Digital Painting course. If you’re already confident in your drawing abilities then I 100% recommend skipping everything and going right to CGMA’s Digital Painting. You can even ask the instructor to look over your work and judge if you’re ready for the course material. However if you are a beginner you’ll have a much easier time learning to paint digitally if you join Paintable or Pencil Kings. Still, if there’s any site that comes close to an online digital art school it’s gotta be CGMA. And their prices are cheaper than even one year’s tuition for an art college. Another online resource you might wanna try is Schoolism. They have a digital painting course created as the perfect intro for beginners. The class is taught by Andrew Hou and it’s really fantastic. Andrew’s work speaks for itself so you know he’s a competent teacher on this topic. The thing with Schoolism is that courses must be paid for individually and they all work on a subscription model. This means if you buy the Introduction to Digital Painting course you’ll need to pay a monthly fee every month to keep your access. If you wanted to add a second course you’d need to pay for that separately. However most people just switch their subscription to a different course once they’re done, so they’ll do the Digital Painting course first and then renew monthly but switch to a new course for the same price. The personal critique fee is much higher than the subscription fee. But it’s actually not much pricier than CGMA. And with Schoolism you get the same quality of one-on-one critiques. However Schoolism’s critiques are only available during set dates when the instructor is available. If you buy either plan you can watch the videos forever as many times as you want. The only difference is that one-on-one critiques must happen during set dates. If you don’t care much for those(or don’t have the money for em!) then definitely try the main Intro to Digital Painting course. There’s also another digital painting course hosted by Bobby Chiu that you might try after Andrew’s course. Recently we published a full review of Pluralsight’s video subscription library. That review has everything you’d need to know about the Pluralsight setup and what you can learn from their library. It’s another monthly subscription service but Pluralsight is by far the largest digital creative video library on the web. It covers 2D art, 3D art, animation, modeling, game design, everything. And yes, they even have a sweet digital painting series that can help anyone move from beginner to advanced with their Photoshop artwork. Note you can try Pluralsight’s free trial and cancel before ever being billed. This is great for testing the waters without committing. But for the monthly fee you’ll get access to all of Pluralsight’s videos along with exercise files, fast support, and even optional one-on-one calls with some instructors. Their digital painting path is made up of many different courses hosted on Pluralsight, all hand-picked by creatives to make the smoothest learning path for everyone. You’ll start with the absolute basics of Photoshop’s interface learning brushes and layer effects, selections, all that good stuff. 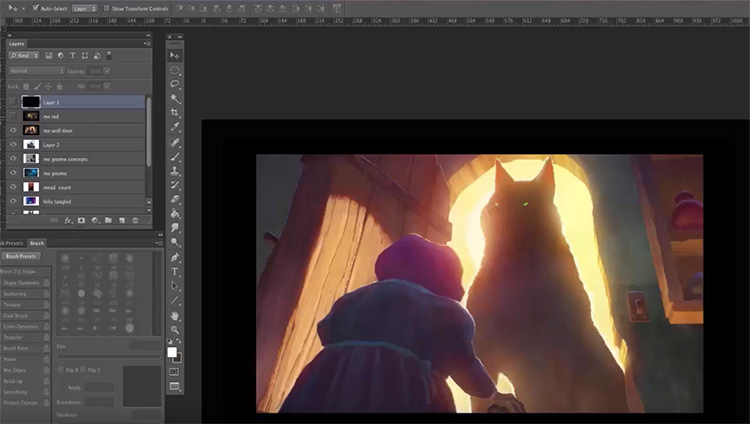 From there you’ll move into more detailed courses on adding photos to paintings and storyboarding in PS CC. Pluralsight is not the best choice for everyone because it’s such a massive library. They can feel a bit “thin” in some art topics because they mostly specialize in GC/VGX tutorials. If you want a more specific source on digital painting I really recommend Ctrl+Paint and the Paintable Academy. But from all of these online courses I guarantee you can find something to take your painting skills up quite a few levels.